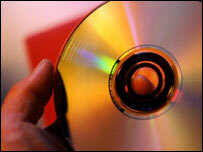 A company that fought net piracy by adding fake files to file-sharing networks is being closed down. Overpeer led efforts to battle the rising popularity of file-sharing networks such as Kazaa. The company tried to make it hard to find high-quality versions of pirated media by flooding networks with fakes holding adverts or garbage. Overpeer's owner Loudeye said it was looking for a buyer for the assets of the loss-making subsidiary. Overpeer came to prominence in 2002 when it was regularly being used by music and movie makers to dilute the number of copies of popular songs and films on file-sharing networks. By making it a chore to find a good copy of what users wanted, Overpeer hoped to force people to turn to legitimate download sources. In a financial filing, Loudeye said the ratings systems that many peer-to-peer networks had introduced to give users information about authentic and fake files had reduced Overpeer's effectiveness. Explaining the decision to close Overpeer, Loudeye said in a statement with industry regulators that the subsidiary had lost a major client in mid-2005 and it had steadily been generating less and less cash. The closure of Overpeer would help Loudeye cut its own operating costs, it said.